For quite a while I’ve heard about techs in some states who actually hold the IR for exposures, especially on cross table work. All I can say about this is: DON”T DO IT – EVER!!! 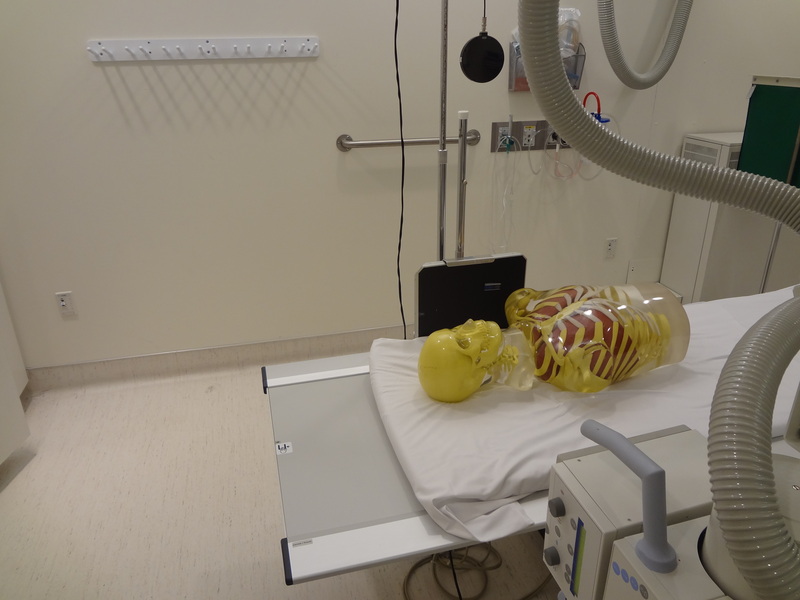 The radiation dose you’ll get holding the IR is extreme. Obviously the more mAs that’s used the more scatter that’s created. This makes holding the IR for a Swimmers or cross table hip two of the worst exposures to be in the room for. Since I don’t have a leg phantom I wasn’t able to show you the dose for a cross table lateral hip. When I get a hold of one I’ll do that experiment and post it. So for now we’ll center on the Swimmers projection. 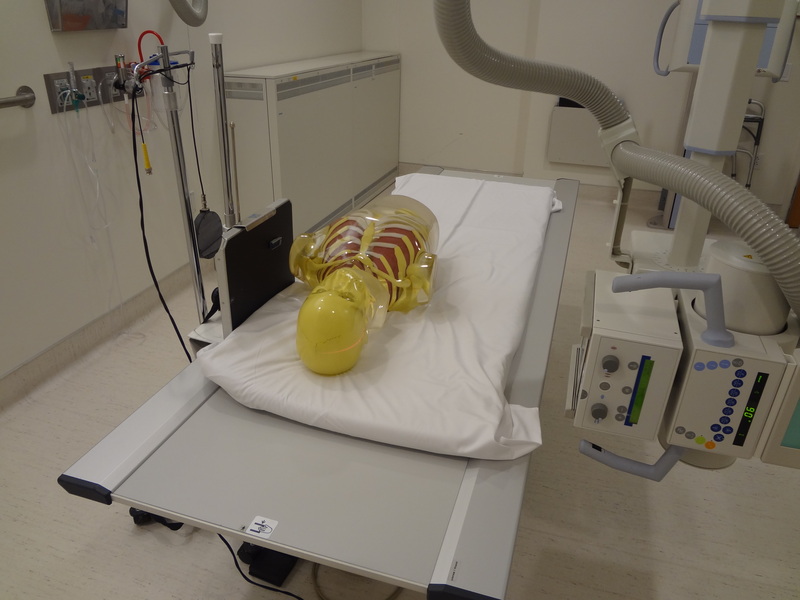 As you can see from image 1, I used my thorax and head/neck phantoms to simulate a recumbent patient. I decided not to put in my shoulder/arm phantom to recreate a Swimmers position as the density would have been comparable to a 350 pound patient. Here are the measurements used for this experiment. 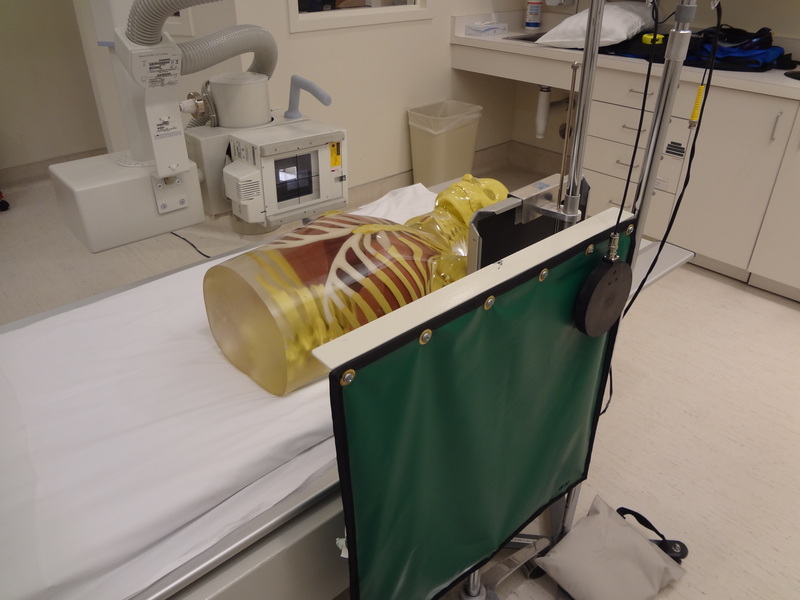 The middle of the patient’s cervical spine was 26” off the floor. I put the ion chamber at three different heights: 32” for gonads, 48” for breast and 57” for thyroid. I used two different techniques: 96 kV @ 16 mAs and 81 kV @ 100 mAs. The higher kV technique is what can (and should) be used for both Swimmers (and cross table lateral hips) and the lower kV/higher mAs technique is what was often used with film and is still currently being used with digital. I made two exposures each and then took the average. I also took the exposures with and without a lead apron blocking it (see image 2). This was to prove that if for some reason you must stay in the room during the exposure (the only viable reason being that you must hold the patient) how important it is to wear a lead apron. 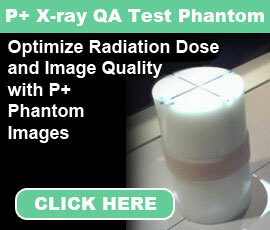 You’ll see that the difference in radiation dose was between 15 and 63 times more without the lead apron. With the ion chamber at 57″ off the floor it received the least dose (direct square law). As the chamber was dropped from the thyroid to the breast and then to the gonads, the dose noticeably increased (again, the direct square law). I’ve shown the dose received with two measurements: milliR’s (1/1000 of an R) and uR’s/MicroR’s (1/1000 of a milliR). You might recall the Significant Experiment “How much scatter is created from an AP chest x-ray?” (http://digitalradiographysolutions.com/how-much-scatter-is-created-from-an-ap-chest-x-ray/) where it was shown that the average person gets about 850 uR’s a day from cosmic radiation and Radon. 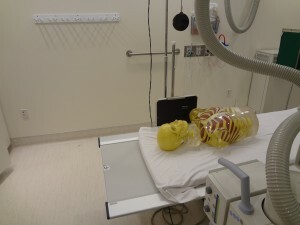 Depending on which height or technique I used for this experiment, some of the doses could be slightly less than a day’s dose equivalent to over 40 days worth of radiation. And remember, this is just 1 exposure!! Dose to tech when holding cassette during exam. Tech is holding cassette for swimmers view. Doses are measured at thyroid (57″), breast (48″), and gonad (32 (32″) levels. SID 40″ Collimated 8×12 . 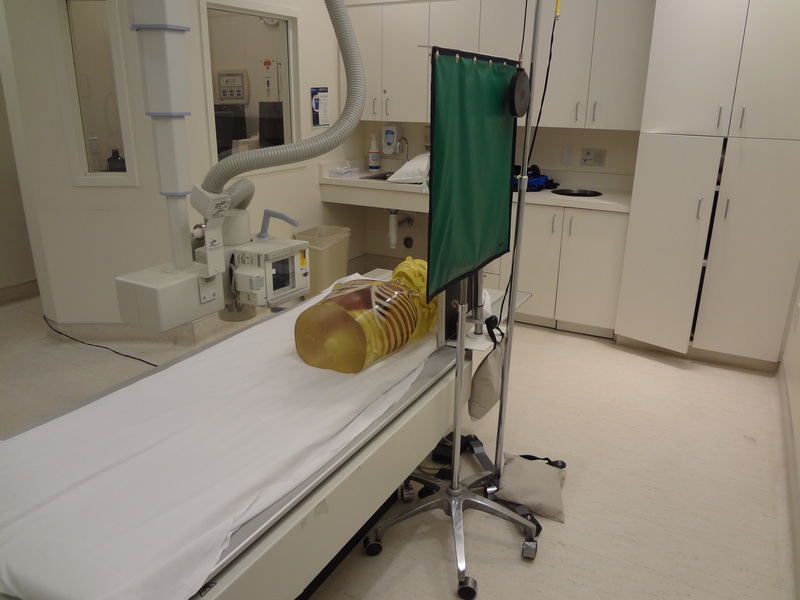 and 4 were included to show how I raised the ion chamber and lead apron to 48” for the breast and 57” for the thyroid exposures. I’ll finish as I started, with me stating to NEVER HOLD THE IR. That’s what “grid” holders were invented for as well as 1 and 2″ tape. There’s just no excuse to put yourself in harm’s way just because you don’t want to take an extra minute or two to set up the IR properly.